Recettear was one of those games that just quietly appeared on PC to become a cult hit. The act of rogue-light dungeon crawling with selling the goods you pick up became a chocolate and peanut-butter kind of design. Since then, we have seen attempts made at tackling it, but no one has managed to hit that sweet spot. Moonlighter is the latest game to step up to the plate and comes close, but doesn’t quite reach that excitement of capitalism and combat. 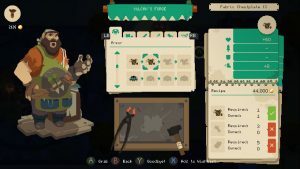 The story of Moonlighter follows a town that was built on the edge of a massive dungeon where heroes go fight, and merchants buy and sell the goods. 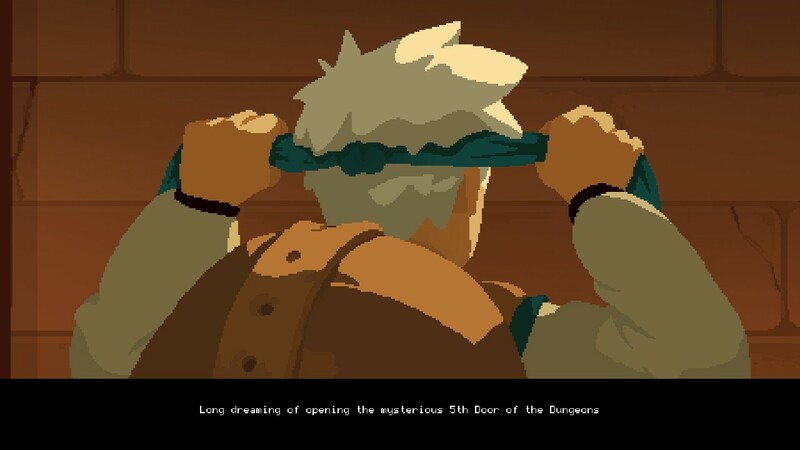 You play as Will, the shop owner of Moonlighter, with the dream to enter the dungeon and solve its mysteries. The game is split between day and night operations. At night, you will enter the procedurally generated dungeons to fight creatures and collect items. The items themselves can be sold to patrons during the day who visit your shop, or used to buy and upgrade gear for future dungeon runs. Besides upgrading your gear, money can be used to bring in new stores that will expand the functionality of the town or your shop. While the shop side of things is a bit light (and we’ll talk about that more later), the combat side of things is the meat of the experience. The dungeon itself is split into different biomes; each with specific monsters, room layouts, and most importantly, materials to find. While it is possible to find actual equipment that you can wear, the bulk of your gear will come from manufacturing them with the materials you find. Enemies attack fast in Moonlighter, and with very few invincibility frames means that you can quickly run out of health. Like the Binding of Isaac, the game makes use of fixed room layouts that are all stitched together to form a single floor of the dungeon. As a surprising twist, the standard “inventory Tetris” has an additional layer to it. You can only hold 20 items in your backpack, but you can use a magic mirror to earn some gold for destroying items. Materials in treasure chests may have curses on them; with the curses impacting other items in your backpack. At the end of each dungeon there is a boss fight waiting for you. There are three ways to leave a dungeon that doesn’t involve running out of health. You can beat the boss, or spend part of your current gold amount on two escape methods. The cheaper one warps you out of the dungeon completely; the more expensive option leaves you a portal that allows you to return to that version of the dungeon. 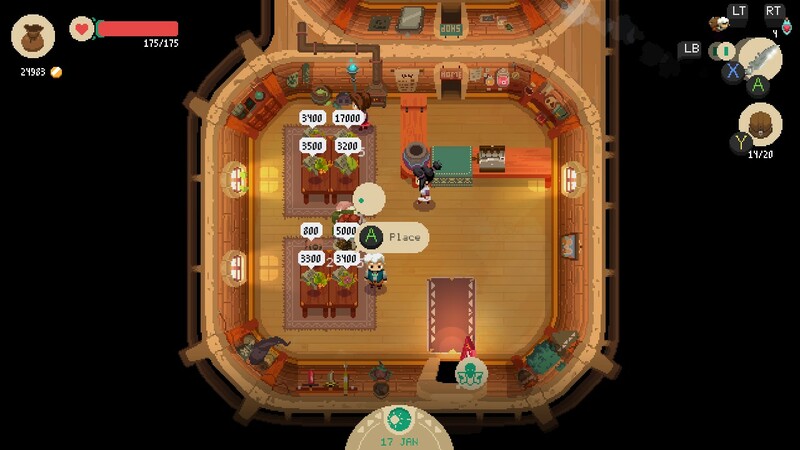 Once you’re done with the dungeon for the day, you’ll go to sleep and began the shop portion of Moonlighter. 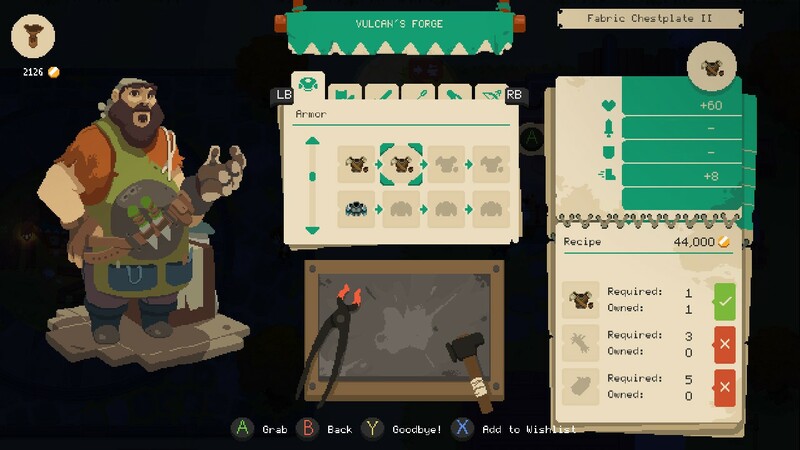 The shop system of the game was designed to be on the simple side. Every item that you can find or craft has a suggested retail price unknown to you. Your diary will rank the items as you find them in order of most value to least. When you price the item and put it for sale, you’ll be able to measure how much someone likes the price based on their reaction. Eventually you’ll unlock the upgrade that allows customers to tip you based on if they like your price, so the earlier you find the sweet spot, the better. The price is also adjusted based on how “hot” the item is at the current moment. Keep selling the same items, and you’ll flood the market and lower their value. The game does add in additional twists like a discount box and thieves to watch out for. Each shop level you unlock via gold will add additional features. The big difference between both games is that Recettear was designed around a quick pace that pushed the player forward, while Moonlighter wants to slow things down. While that is certainly commendable, Moonlighter’s systems just lack the depth for that long burn. Let’s start with the combat side of things. Moonlighter’s combat was on the basic side. There were only a few kinds of weapons, with each weapon type getting one “special” attack. All gear in the game is hard coded, so there are no loot tables or rarer versions of items to impact quality. Upgrades are built on a tier system, with weapons having two paths to go down. From a player’s perspective, weapon and armor upgrades do not change the gameplay outside of deciding to go range or melee. With only a handful of ways to attack with each weapon type, combat gets repetitive quickly. 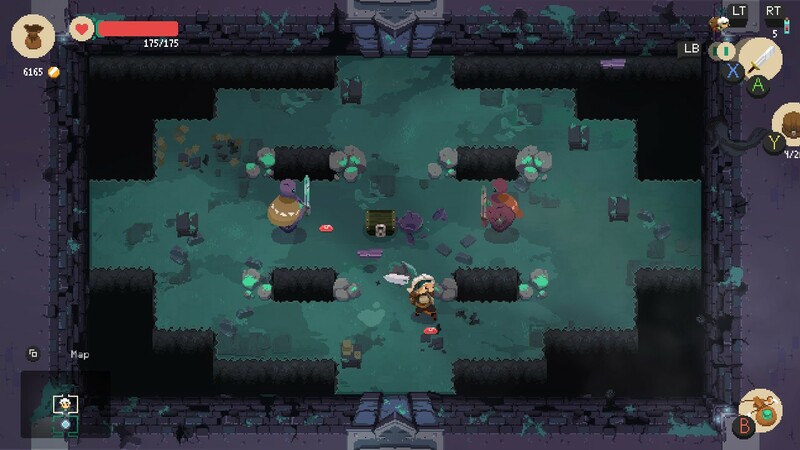 Moonlighter’s dungeons also suffer from a lack of room and enemy diversity. Each biome only has a handful of enemy types, with many of them repeated on later floors with their stats slightly raised. For an unknown reason, some rooms don’t force you to fight every enemy to continue, and others do. The problem is that the difficulty of the room is dependent on the fixed layout and whatever enemies the game decided to drop in there. Getting a room where enemies with quick attacks occupy small ledges can be a killer, but having them on wide areas was a piece of cake. There was also a lack of random events to help spice up the biome. You may find “lore rooms” and special events here and there, but they quickly began to repeat, as do the room layouts. Recettear also didn’t have too many room variations, but random events and the general speed of play helped in this regard. There were also more boss fights to deal with in each individual dungeon. Essentially, the core gameplay loop of Moonlighter is to keep upgrading your gear with repeated runs until you can challenge the boss, unlock the next biome, rinse and repeat. For those that hoped the shop side would keep things engaging, I’m afraid the inventory is a little light here. The core gameplay loop of going into the dungeons to get gold needed to upgrade your town doesn’t last as long as the combat side. There are only four tiers of shop upgrades, and five additional merchants to bring in. Unlike Recettear that tried to give the characters personality, the nameless NPCs of Moonlighter are disposable. An old lady will be just as interested in buying a magic sword as she would poison spores. Over charging someone an item may make them unhappy now, but they’ll be ecstatic to buy it on sale a few seconds later. There are items you can buy that adjust the look of your store, but they don’t matter as much compared to Recettear. On the plus side, Moonlighter is a lot easier to manage compared to Recettear’s hidden dungeon requirements and timer. There are no time limits forcing you to complete the game or earn X money. As long as you are willing to keep diving back into the dungeon, the game will go on. Still, I would have liked a bit more simulation here, especially in terms of progression. Once I found the gear that I wanted to use, every other material in the game became worthless to me outside of selling them in the store. Selling tons of items or selling very little will not do anything to advance the progression or unlock new events; the only thing that matters is completing the dungeons. 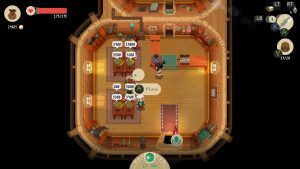 Moonlighter is the closest yet to a game hitting the same heights as Recettear, but it still has some ways to go. The developers are talking about post release support, but nothing concrete at this time. Of the shop simulator games I’ve played, this one gets the closest to that balancing between the two game systems, but it’s just not all the way there yet.